New Year’s Eve can be a harang of crowds and expensive activities. It’s fun to go all out, but sometimes I just want a chill vibe. This year, consider choosing a neighborhood restaurant for a relaxed way to bring in 2019. Arte Cafe (106 West 73rd Street) This neighborhood favorite with intimate candlelight ambiance will make you forget the craziness of Times Square. The staff has waited on regulars forever but will still treat you like one. For the last day of 2018, they are offering a four-course dinner for $60 with complimentary champagne to kick off your meal. Course selections include Black Truffle Lobster Bisque, Homemade Pumpkin Cannelloni and Filet Mignon. 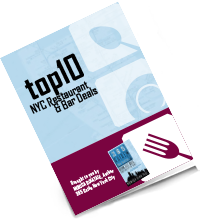 Most Upper West Siders visit for their happy hour from 12-7 p.m. daily. Savings include $1 oysters, $4 beers and $6 meatballs. I highly recommend the homemade pastas because they are delicate yet flavorful. Boqueria (4 locations) If you have a few friends to share a meal with on New Year’s Eve, Boqueria is the perfect place. With four locations in Manhattan, Boqueria is serving a family style tapas feast that includes unlimited beer, wine and sangria. Their generous beverage pouring is sure to put a sparkle in your New Year. The first seating is from 6-9 p.m. for $85 and the second is 9:30-12:30 for $125. You can dine early and still get home and watch the ball drop in your fuzzy slippers. The lively open kitchen serves classic Spanish tapas inspired by the season’s best products. During the week from 3:30-7 p.m. take advantage of discounted drinks and small plates. Menu selections are fresh and often pack a spicy punch. Uncle Nick’s Greek Cuisine (747 Ninth Avenue) Uncle Nick’s delivers moderately priced Greek food in family-size portions. They are especially proud of their selection of dock-fresh seafood like Garides Ellinikes Grilled Shrimp and Xifias Swordfish Steak ($25). Appetizers range from $7 to $18 and entrees start at $20. I like to begin with The Four Combo Dips ($12) with Tzatziki, Tarama, Melitzanosalata and Scordalia. Smother the pita in Greek olive oil and let the party unfold. Make a reservation to secure your spot and avoid waiting.